Map of The World Illustrating the principal features of the Land and the Co-Tidal Lines. / Map of the World Showing the principal Ocean Currents & Boundaries of River Systems. 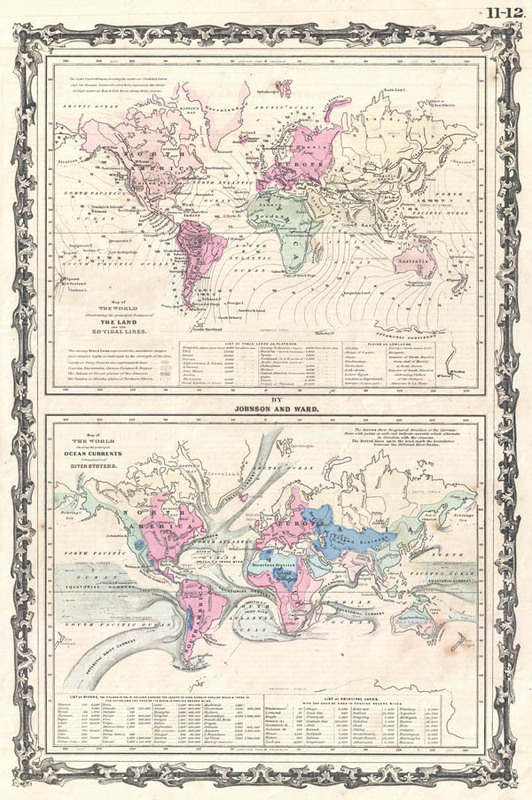 This is one of the thematic world map sets from the rare 1862 edition of Johnson and Ward's Illustrated Atlas Family Atlas. Features two maps drawn within a single border. The upper map depicts the world's co-tidal lines with notations regarding world table lands and lowlands. The lower map very attractively displays the important ocean currents. Shading in the landmasses show the influence of various river systems. Features the strapwork style border common to Johnson's atlas work from 1860 to 1863. Published by A. J. Johnson and Ward as plate numbers 9 - 10 in the 1862 edition of Johnson's New Illustrated Family Atlas. This is the first edition of the Family Atlas to bear the Johnson and Ward imprint. Very good condition. Light overall toning. Rumsey 2905.004 (1860 edition). Phillips (Atlases) 6140.4-5.